A cyclist was found unconscious on the northbound side of the road with no recollection of how he got there. 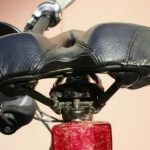 The police accident report concluded that he had lost control of his bicycle due to gravel along the edge of the road, but there were no witnesses to the accident. Our experts reviewed the police report and photographs, as well as the deposition testimony of the cyclist and his medical records. They inspected the bicycle, the cyclist’s riding apparel and helmet and also performed a site inspection of the roadway’s geometry and conditions. ARCCA’s inspection of the bicycle and apparel revealed several key findings: (1) an abrasion to the right rear of the seat; (2) the seat was twisted with the right side higher; (3) there were scuff marks on the right buttock area of the cyclist’s riding shorts; and (4) there were abrasions to the front left side of his helmet. A review of his medical records indicated that the cyclist sustained predominately left-sided injuries – a neck fracture consistent with neck extension, and a contusion on the right lower buttock area. The site inspection showed that the road was a very lightly traveled country road with edges that were broken and uneven and with rutted sides in the area of the incident. The cyclist testified that he did not remember anything about the accident, but that his normal route was southbound. He indicated he would generally ride towards the center of the road because the right side was broken and had uneven conditions. Final Findings: Our team determined that the confluence of the evidence suggested the cyclist was contacted on his right rear buttock by a phantom vehicle passing on the right. They confirmed this theory with a vehicle fit check, which demonstrated that the right side driver’s mirror would have been in close proximity to the cyclist’s right rear buttock. Furthermore, there would have been enough room for a vehicle to pass the cyclist on the right if he was riding out towards the center. The impact to the cyclist’s right side was consistent with him coming to rest on the left side of the road. Our experts also found that the cyclist’s position towards the center of the roadway was consistent with safe cycling practices for avoiding hazardous roadway conditions.